KRALENDIJK - The Attorney-general of Curaçao, Sint Maarten and the BES-islands, Guus Schram, hosted on Tuesday, November 1st the bi-yearly meeting of Attorney General's in the Kingdom. This time the meeting was held on Bonaire. Twice a year the AG’s of Curaçao, Sint Maarten and the BES-islands, Aruba and AG’s member of the Dutch ‘College van Procureurs-generaal’ meet and consult on several matters. Besides the preparation of the Judicial Four Parties Meeting (on January 10 in Aruba), also other matters are discussed. These often relate to the coordination of investigation and prosecution and mutual cooperation. The AG consultation, therefore seeks the Public Prosecutor’s Offices of the different countries to benefit as much as possible from the fact that they operate within the same Kingdom. For this edition, Theo Bot, a member of the Council for Law Enforcement, was invited to speak with the AG’s about the state of the law and how more efficiency can be reached from the succession of useful inspections and Council reports. 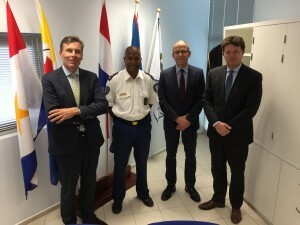 In addition, the AG’s exchanged ideas and agreed that cooperation between the National Detectives Agency’s (Landsrecherche) of Curaçao, Sint Maarten and Aruba and the Dutch National Criminal Investigation can be improved and intensified. This was a follow-up to the meeting that took place in May during the previous AG’s consultation, where talks were held with the heads of the National Detectives Agency of Curaçao and Sint Maarten and the Director of the State Investigation Department. After the meeting of AG’s a visit was realized to the Dutch Representative of the BES-islands, Gilbert Isabella and Island Governor Edison Rijna. There was also a meeting with the leadership of the KPCN. One of the many topics was how the police force is currently handling the consequences after the violent death of police officer Ferry Bakx. How this has affected the community and the police force in particular.